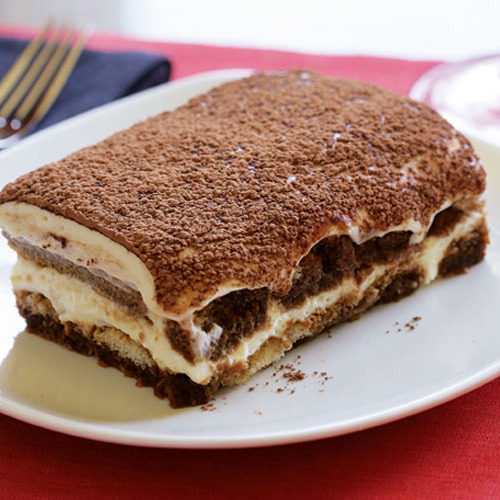 This recipe calls for uncooked eggs, so keep the tiramisù refrigerated and serve it within 48 hours. Pour the coffee in a large bowl and add 2 Tbs. of the sugar while it’s still hot. Stir well and let it cool to room temperature. Add the rum, if using. Combine the egg yolks and the remaining 1 cup sugar in the bowl of a stand mixer fitted with the whisk attachment. Beat on medium-high speed until the yolks are pale yellow and fluffy, about 5 min. (The mixture will be fairly thick at first.) Add the mascarpone and beat until it’s fully incorporated into a smooth cream, 2 to 3 min. more. Transfer to a large bowl. Thoroughly wash and dry the stand mixer bowl and whisk. Put the egg whites in the bowl, and whip on medium-high speed until they form medium-stiff peaks when you lift the beaters (the tips should curl over onto themselves just a little). With a rubber spatula, fold about one-quarter of the beaten whites into the mascarpone cream to lighten it. Then gently fold in the remaining whites, taking care not to deflate them. Cover with plastic wrap and refrigerate. Submerge one ladyfinger in the cooled coffee until the coffee penetrates about halfway through, leaving the core dry (break it to check). This can take from 1 to 12 seconds, depending on the type of ladyfinger. You don’t want the ladyfinger to get completely soaked or it’ll become soggy and fall apart. You should be able to feel that the outside is soft, but the inside is still firm. Break one ladyfinger after you’ve dipped it in the cooled coffee to check that the coffee has penetrated only halfway through, leaving the core dry. 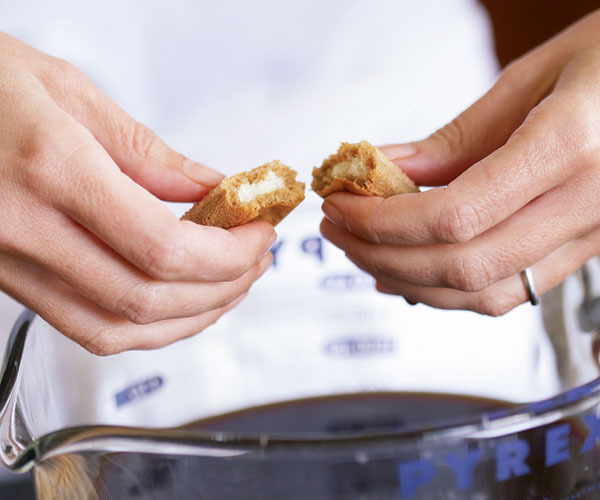 Once you’ve determined the correct soaking time, submerge each ladyfinger individually, gently shake out excess coffee, and immediately set it in a 9×13-inch baking dish; continue until you have one tight layer that covers the bottom of the dish. (You may need to break a few ladyfingers to fit in snugly.) 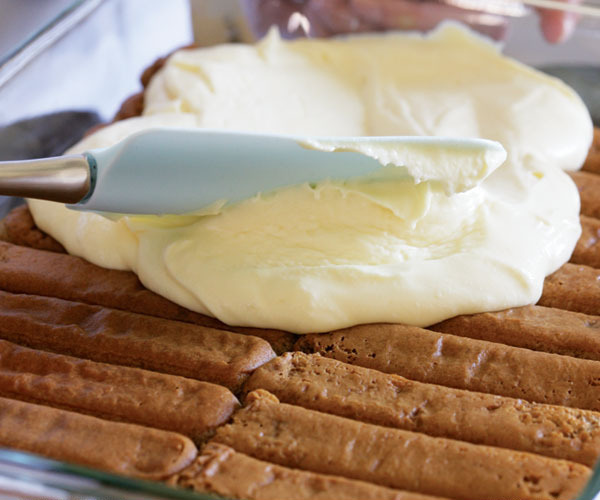 Spread one-half of the mascarpone cream evenly on top of the ladyfingers. Spread half of the mascarpone on top of the first layer of ladyfingers. Repeat the soaking procedure with the remaining ladyfingers to create a second snug layer, arranging them on top of the mascarpone cream as you did for the first layer. Spread the rest of the mascarpone cream evenly on top. Cover the dish with plastic wrap and refrigerate for at least 2 hours. 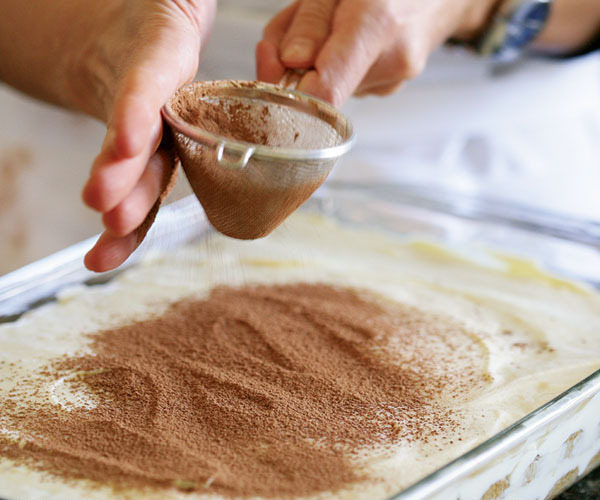 Before serving, sift the cocoa powder or finely grate the chocolate over the top to evenly cover. 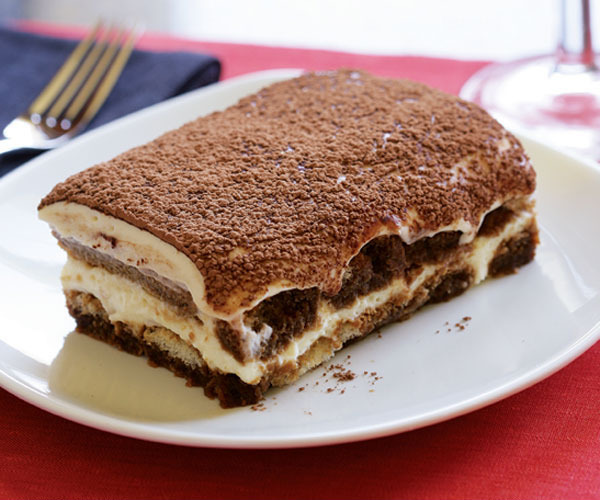 Use a fine-mesh sieve to finish off the tiramisù with a generous dusting of cocoa powder before serving. If the uncooked eggs in this dish are a concern, use pasteurized eggs. I eat this every day because i really like it. I tried it at home and the taste of it was amazing.